Arriving in England as an unknown quantity to many English fans, Javi Garcia is swiftly cementing his name in Watford folk-law as the Hornets are currently enjoying their best Premier League season. The Golden boys are lingering around the final Europa league spot level on points with 7th place Wolves. The remaining nine games promise to define a fascinating contest between Nuno Espiritio Santo's men and Javi Gracia's side for that final Europa League spot. After assembling Watford as a consistent force with a potent attack and equally strong defence in the league, Gracia's army have taken advantage of Cup exploits enduring a long cup run in his first full season in charge. Despite Gracia's extraordinary success at Vicarage Road, his achievements have been overshadowed by the fascinating tussle at the top of the Premier League between Liverpool and Man City. But the achievements of the Spanish boss shouldn't be discouraged, he's transformed Watford from a team battling at the lower end the Premier League table to a bustling, organised and an entertaining team on the eye competing in the upper echelons of the table. Surely a contender for manager of the year? Watford's enigmatic structure of running the club is baffling, yet is something that has worked extraordinarily well under the reign of Italian owner Gino Pozzo. In the Pozzo family era beginning in 2012, the man at the helm has lost his job at the subsequent end of every season regardless of achievement. In 2015, former Fulham boss Slaviska Jokanovic exercised this managerial structure through his incredible achievements. He delivered Watford a second place finish and their Premier League status for the first time since their relegation in 2007. Despite winning promotion, the unfortunate Jokanovic was replaced by Quique Sanchez Flores who propelled Watford as high as 10th in his solitary season in charge. After an impressive first half of the season which saw the Hornets accumulate 36 points by February, the Spanish tactician prioritised an FA Cup run, but eventually fell at the penultimate hurdle against fellow rivals Crystal Palace. Working with a core of the squad from their promotion winning team, a lack of squad depth took a toll on the final third of Watford's season. In the remaining 13 games, Flores picked up a measly return of 8 points and still remained in 13th place - an acceptable finish on their Premier League return. However, Watford's owner shockingly sacked Flores in May 2016 which certainly defined being a manager as a the most unforgiving job in football, if an example ever proved that hypothesis. 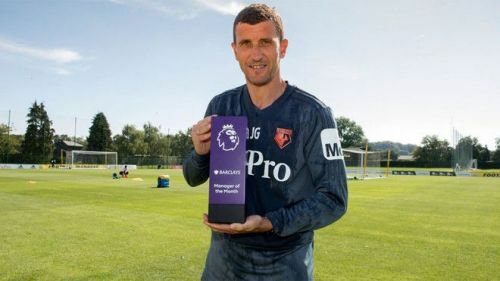 After taking over from Portuguese boss Marco Silva on January 21st 2018, Javi Gracia had been expected to encounter a short-lived spell at Vicarage Road and was tipped to be a short-term appointment till the end of the season. But unlike the former managers to grace the dugout at Vicarage road, Gracia has been a managerial anomaly with Gino Pozzo. The Watford manager has been their longest serving manager since Gianfranco Zola who lasted from July 2012 till December 2013 before getting the sack. Remarkably, Gracia is approaching 14 months in charge, but who would discount the possibility of this man from being sacked at the end of the season? Although, the Spanish boss endured a mixed start to life under Pozzo's spell, Gracia who was working with a squad assembled by the dozen managers before him, managed to collect a respectable 15 points from a possible 42 available and delivered a 14th place finish. Gracia mainly utilised the 3-4-3 and 4-2-3-1 systems but failed to get the best out of a talented squad. Despite beating an out of sorts Chelsea 4-1 on the manager's homecoming, Javi Gracia had yet to find a system that would utilise the best assets of his players. With a full pre-season under his belt, Gracia built a team that would fit into his newly adopted, pioneering 4-2-2-2 system with the two 'attacking midfielders' playing as inverted wingers. Will Hughes, a natural central midfielder is a left footer who operates on the right as an inverted winger and Roberto Pereyra is a right footer on the opposite flank. The creative juices of these attacking assets sprinkle when Watford break on the counter attack or by controlling the game in the oppositions half. After soaking up pressure, the Hornets have the technical ability and pace in their side to break with ease and pick out the right passes. This has been emulated in a number of games, more notably in their 5-0 demolishing away win at Cardiff where Spaniard Gerard Deulofeu scored a hat-trick. Gracia's style is ruthless and the relentless attacks coupled with Cardiff's poor defending, made sure the Spanish boss stamped his authority on the match. A key component to Watford's attacking play is the full backs; Jose Holebas and Daryl Janmaat are also given the license to roam forward from their positions. The inverted wingers are used as a decoy for the full backs to attack on the outside and whip effective crosses into the box. Watford full back Jose Holebas has found a new lease of life under Gracia, the former Greek international is second on the list of assisting full backs with 6 - tied with fellow full back Trent Alexander-Arnold and only bettered by Andrew Robertson with 8 assists. Gracia emphasises the importance of full backs. In this system, Watford's talisman Troy Deeney operates in the deep lying forward role and Gracia has also managed to get the best out of the talented Gerard Deulofeu. A product of the La Masia academy, Deulofeu's Premier League career took a while to take off, but under the guidance of Gracia, a rejuvenated Deulofeu is finally showing the raw talent he possesses on a more regular basis. The Spanish forward has formed an old-fashioned partnership with Troy Deeney. Deulofeu is the player with natural flair and pace to make runs in behind the defence, whereas Deeney, is the strong, bustling centre forward capable of holding up the ball and finding his tricky striking compatriot - a Crouch and Defoe or a Niall Quinn and Kevin Phillips-esque partnership beginning to form. Arguably, though, the two most influential players in this system are the two box to box midfielders - assigned to protect the defence and ignite attacks going forward. Energetic players are needed for this system to work, fortunately Gracia has the domineering duo of all-round, strong tackling midfielder Abdoulaye Doucoure and complimentary midfield architect and defensive screen, Etienne Capoue. Likened to the roles N'Golo Kante and Danny Drinkwater played in Leicesters triumphant title winning campaign, Doucoure's energy and ability to cover every blade of grass is similar to Kante's 'water-carrying role'. Whereas, Capoue's range of passing and tacking ability likens him to the architectural role Drinkwater utilised under Ranieri at Leicester. The stand-out performances from Abdoulaye Doucoure have sparked interest from a number of Premier League clubs, the player possesses every attribute requisite for a modern central midfielder and would quite easily fit into the majority of the sides currently in the top six. Gracia's side are blessed with natural footballers, Roberto Pereyra is an export from Italian giants Juventus and has flourished by having the freedom to operate in central areas and causing havoc out wide. Will Hughes has also thrived in this prosperous system, the player who made his name operating in a central midfield role for Derby. Uses his exquisite range of passing, intelligent runs from midfield and tackling ability to good effect in his altered position. Despite enduring a laboured start to his Watford career under previous managers, the 23-year-old is developing by each game and has earned plaudits for the energy he poses and willingness to track-back to help full back Daryl Janmaat or Kiko Femenia. The attacking exploits foraged in this entertaining system have overshadowed the Hornets defensive ability this season. Despite only keeping 7 clean sheets, a defensive partnership of Adrian Mariappa and Craig Cathcart have impressed in a team that is free-scoring going forward. Craig Cathcart has made 22 blocks this season and 153 clearances - two stats which place him near the top ranked Premier League defenders. After re-signing for a club he had represented in their last spell in the Premier League over a decade ago, Ben Foster like many players in the Gracia-era, has revitalised his career. The former England international goalkeeper could be in contention for international reckoning again after putting in a string of consistent performances this season. Foster has gained recognition for his cat-like reflexes and ability to command his penalty area, the English shot-stopper has made 29 high claims from crosses and only Newcastle cult-hero Martin Dubravka has made more than him with 32. The Watford goalkeeper has also been an effective shot-stopper when called upon, Foster has made 92 saves, only bettered by David De Gea, Neil Etheridge and Lukas Fabianski. Gracia's options on the bench have become a key component in their ability to maintain their consistent energy levels and by utilising every facet of their squad. Although striker Andre Gray hasn't been granted the starting birth under Gracia due to the form of Deulofeu, Gray's similar technical attributes to the Spaniard have become an important fixture arriving off the bench. Gray's natural pace, defence piercing runs and finishing ability have offered a striking option most Premier League clubs outside the top 6 would take. In Watford's last league game, Gray made this desired impact off the bench, he dispatched his only chance in the 92nd minute to sink Leicester and claim a 2-1 victory. Javi Gracia's variation of the 4-4-2 formation has become a system inspiring the neutrals to watch how Watford sprinkle their footballing philosophy on their opposition. A fast-moving, explosive style with marauding full-backs, bullish midfielders and a potent strike force, has compiled ingredients for success in Gracia's first full season in charge. Watford have become an intriguing outfit to watch at Vicarage Road and any success they retrieve this season will be down to Gracia's own individual style that he is imprinting on the Premier League. With Europe and an FA Cup still to play for, the smiling Spaniard has brought a feel good factor back to Vicarage Road that the former Graham Taylor would have been proud of.